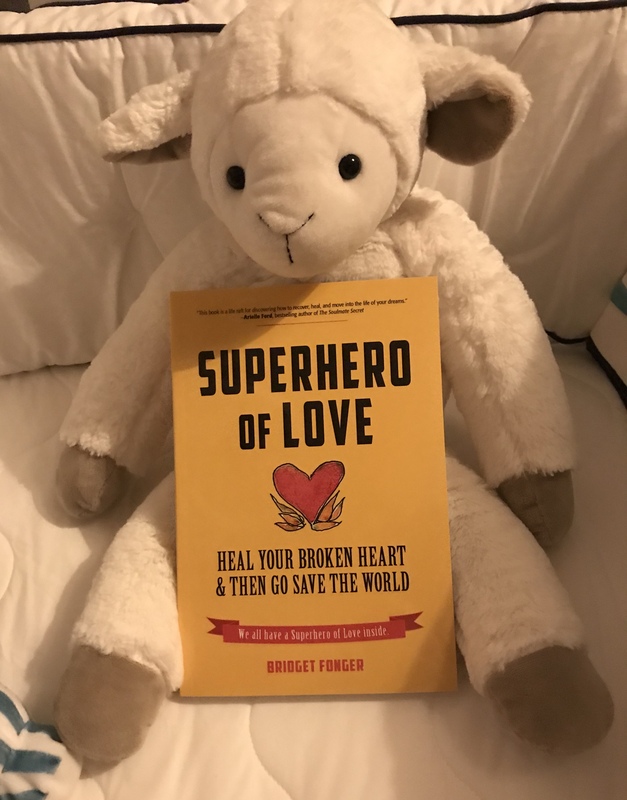 My book Superhero of Love: Heal Your Broken Heart & Then Go Save the World was born into the world today, the first day of 2019, and I’m a crazy new mom. When you publish a book but are not a celebrity of sorts, it’s easy to feel that you are a bit of a loser on the first day of book sales. Although I was warned about this day by book publishing expert Kelly Notaras (The Book You Were Born to Write: Everything You Need to (Finally) Get Your Wisdom onto the Page and into the World, Hay House, November 2018), I still freaked out. OK, not just one single freak out, several over the course of the day. Like every child born to its mom, this book baby has unique lessons that only it can teach me. And it’s throwing up all the lessons contained within its covers — and more! At this moment, she is tucked in for the night and I am a little exhausted by our first day together. And, I sit humbly at the feet of my first lesson: the word enough. Look at this beautiful word. It will help you. It can be a vine in the crazy jungle of life. And so it is that on this exciting-yet-stressful day the word enough is the vine I am holding onto to catapult me into 2019 as powerfully as possible. My friend, Jen Pastiloff (whose book On Being Human: A Memoir of Waking Up, Living Real, and Listening Hard will be out in June) is famous for repeating this mantra for all of us: “You are enough.” I didn’t even get how very empowering it was until today. My relationship with this word has not been a powerful one. I thought it was for other people. For myself, I inserted a silent “just” in front of it. I belittled it. I also thought it was a slippery slope this enoughness. If I focused on being enough, I would lose my way to being great. Now I see the profound greatness in enoughness. Everywhere I turn, friends and wise ones are encouraging me to remember what Eckart Tolle’s The Power of Now and so many books have tried to tell me for decades: now is perfect just the way it is and just the way it isn’t. Now is enough. We are all enough right now. Not good enough, thin enough, rich enough: JUST. ENOUGH. In 2019 I will embrace my enoughness. I’m excited to see how this might show up in my life because I imagine the more I feel like I am enough the more people will enjoy being around me because they will feel like they are enough too. Nowhere for us to get to, nothing for us to attain to be enough right now. That sounds like the most healing dose of love to me. Enoughness will make me a far more powerful Superhero of Love for sure. Being generous doesn’t have to be difficult or weighty. You can’t be heavy and serious when you are in the business of sprinkling anything. Sprinkling love and kindness sounds downright fun, doesn’t it? Also, inherent in the dosage known as a sprinkling is enoughness. A sprinkle of love and kindness can go a very long way. I am committed to doing what my book intends for all who read it: be more able to love and be loved. I am committed to sprinkling love and kindness. I am committed to knowing my enoughness – and yours. I say that we all have a Superhero of Love inside us that is powered by the eternal source of love that has been inside us forever. I call it a Mighty Flame. I know that my contemplation of enoughness and my quest to sprinkle love and kindness will feed that flame. I hope that your Mighty Flame grows in 2019. Imagine a planet glowing with all our sweet Mighty Flames, imagine that love. I hope that in 2019 we all know ourselves as Superheroes of Love, that we know we are enough, that we are loved and that our sprinkles of love and kindness make an enormous difference in the world.